Em pulled this ornament from the box and said “Ohhh, this is the one I made when I was a little kid…” It slayed me. It’s not difficult to reduce me to tears (as I have mentioned at least 800 times of late) but this was a different kind. The nose tingling, eyes watering “I think I am doing this right” tears. I have heard more than a few parents lament that if you”re “doing it right” they need you less and less. 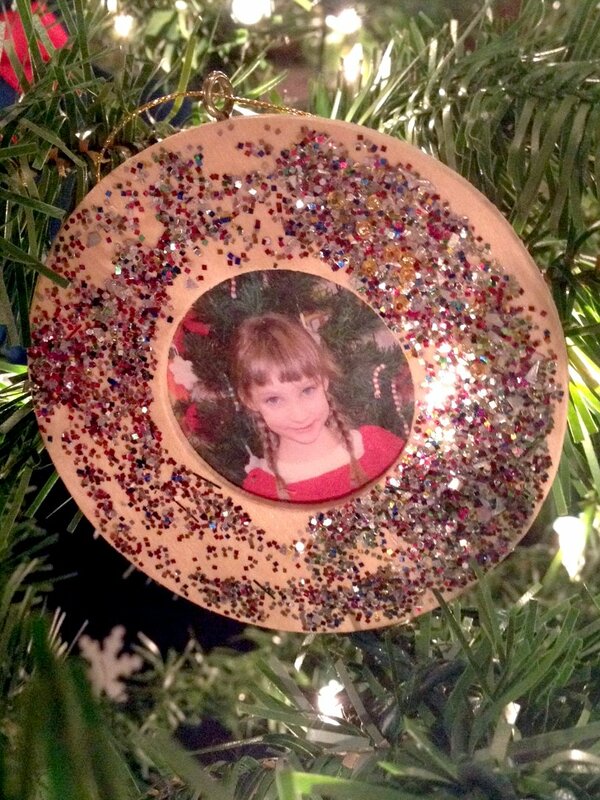 Our "little girl" made this ornament just last year in pre-school. In the past few months I have watched as my lap grows smaller and smaller and my “little girl” is literally pushed right out of “the nest.” And it pains me. I have come to terms with the fact that Love is infinite. That I will find the Love that two children require. But I can not deny that both Time and my lap are finite. I struggle to envision how I will share them with two children. Already I feel I do a less than adequate job sharing my Time with only one child between working and mothering. How does one expect to blend another child in to the family without taking from the first? And then I look at the face in the ornament. She looks so different than the face I see today. I see her flounce down the stairs in an “outfit” she has assembled. Skinny jeans and a tshirt, her boots and a high ponytail. I eavesdrop as she and her buddy discuss the best way to pass a baby to someone else without “flopping the head.” I watch her practice being a Big Sister to her baby doll. (A baby doll that has recently acquired a middle name. A middle name that we have incidentally settled on for Baby D.) Her teeny little self drags the empty trash can up the driveway without being reminded. Stopping only to have me unlock the gate so she can put it away. She empties the dishwasher while I make dinner, reminding me to check her back pack for a note from her teacher. Last night after her shower her wet towel was hanging from the hook on the bathroom door. Her dirty clothes in the laundry basket. Well, then. Merry Christmas to you, Baby Girl. 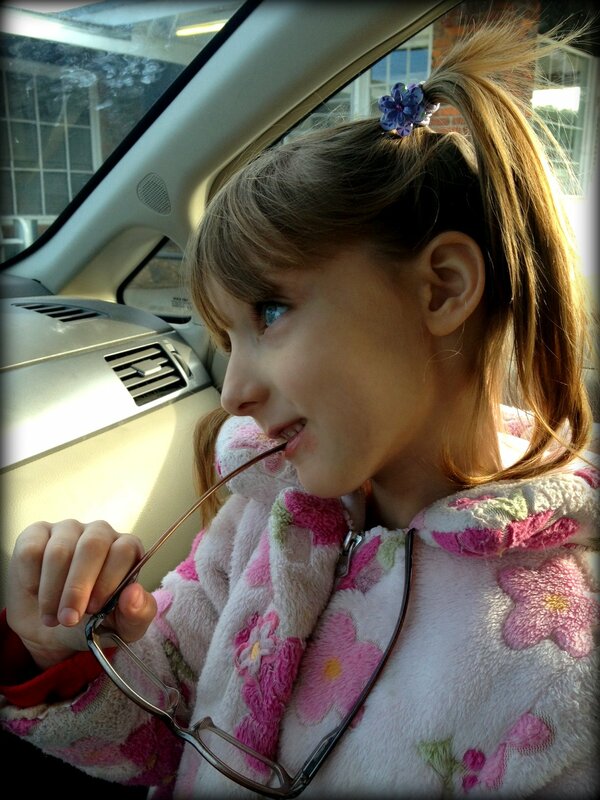 In spite of this new baby and your big grown up self you will always, always be my Baby Girl. She hopped in to the front with me while we waited for MQD at the barber the other day. "Look at you in the front seat, Miss Thang!" She grabbed my glasses and began to pose. Apple doesn't fall far from the tree. This entry was posted in Family, Parenting, Pregnancy and tagged Christmas, Decorating, Emily, Ornaments, Pregnancy. Bookmark the permalink. I remember when you did this…grew up while i was in the bathroom or somewhere. Like you, she’s so pretty. And I see Lance again in her twinkle!